Born in Leicester in 1874, he was educated at Oakham School, and joined the family shoe business of Stead and Simpson Ltd in 1894, becoming a Director in 1898, later Managing Director until 1958, and Chairman 1924 to his death. Gee was a major figure in Leicester life through much of the first half of the 20th century, and a very generous benefactor of local causes. 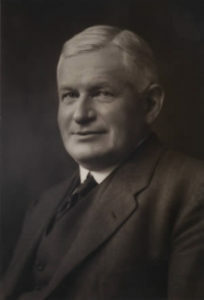 He was one of the founder members of the Leicester University College, and served on the College Council from 1924 as successively Treasurer, Vice-Chairman and Chairman, financing the College personally through financial crises of the 1930s. When the College received its Royal Charter Gee became the first Pro-Chancellor and one of the first Honorary Graduates of the University of Leicester in 1958. Other public service included chairing the Leicester Savings Committee, the Leicester Chamber of Commerce and the Leicester Literary and Philosophical Society, service as a Justice of the Peace and a Lay Canon of Leicester Cathedral. Honours: OBE, 1941, Honorary Freeman of the City of Leicester, 1950, CBE, 1953 and Hon. LlD, Leicester University, 1958. He is also commemorated in the dedication of the University’s Percy Gee Building.